she finally read my script the other night (the one that made it to the finals). She loved it and even had some great notes/ideas for me that I’ll try out when I crack open the re-write. It’s nice having a partner who bounces ideas back with me while laying in bed. She’s not a writer and I think that’s more helpful. She sees things as a viewer…as one of my audience members. That’s probably more valuable than most notes I could get because she’s the singular version of the masses I want to write for. Anyways, it was nice to talk about my script with her and get her reaction to it. She tried to talk to me about it the other night when she first read it but I was in the midst of being asleep and being awake and was completely useless. She said she got goosebumps and even cried at certain points. That’s a good thing! No matter what size the validation is…it’s enough to get me going again. 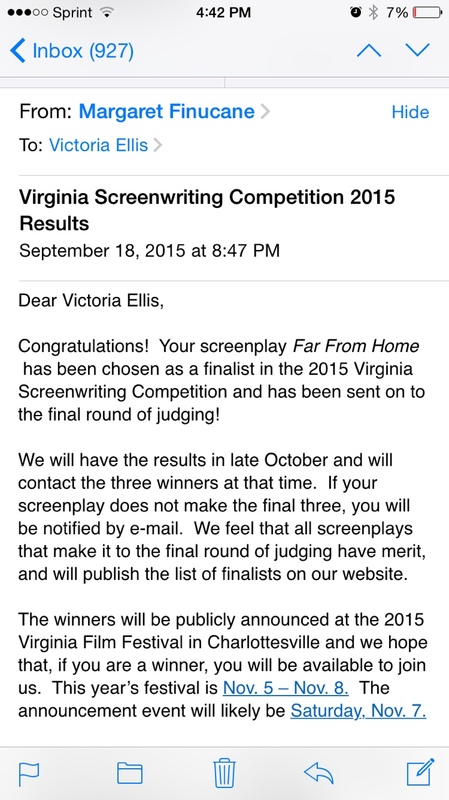 I recently found out that my screenplay was selected as a finalist for the Virginia Screenwriting Competition. The short bit of notes I received for the submission were spot on and now I can’t wait to tackle a re-write of the script. I’m not sure if I will do a page one re-write, but I know that there’s quite a bit of room for the story to grow some more for at least two characters that could really add to the overall story at hand. I’ve been neglectful of writing in general. I have recently found some strong footing in life that I’m more hopeful about the future and what it holds…and getting this email just piled up on top off all the good fortunes being tossed my way that I absolutely can’t ignore it. I can’t ignore what it could possibly mean. That maybe I really CAN do this screenwriting thing. So here’s to attempt number 198274124970746…hopefully I can make it count.